The Royal Netherlands Air Force once operated 213 Lockheed Martin F-16A/B Fighting Falcons. Of these 177 were single seat F-16As and 36 F-16Bs. 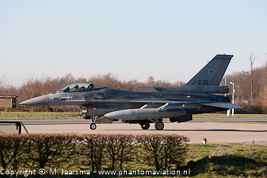 Several upgrades (Mid Life Update) resulted in144 F-16AMs and 25 F-16BMs operated by the RNLAF before defence cuts resulted in MLU F-16s withdrawn from use. The Netherlands Ministry of Defence reported 68 F-16's including seven operational reserve aircraft assigned to the RNLAF on January 1, 2016. During 2019 the first operational Lockheed Martin F-35As will be delivered to the RNLAF. Six will be based in the USA for training while two will be delivered to Leeuwarden Air Base. The arrival of the Lightning II will see the start of the wind down of the Dutch F-16s. The transitioning to the new fighter takes place from 2019 until the end of 2021 when the F-35A according to the current plans should receive its Initial Operational Capability (IOC). 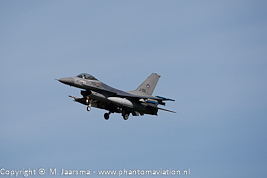 Until the IOC the F-16 will remain the primary fighter of the RNLAF. Therefore until the end of 2023 when the final aircraft should be withdrawn from service the are tasked as stated in below table. For comparison the data of the F-35A have been added in the table above. The F-16s are tasked with Quick Reaction Alert for the Benelux which is rotated with the colleagues of the Belgian Air Component and are available for the EU Battle Group and NATO Rapid Reaction Force. Two F-16s were damaged during incidents. 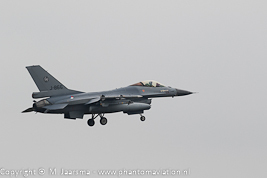 One is the F-16BM assigned to Kantoor Test Vliegen (KTV - test flight office). It's expected to return to flight status after all its test equipment has been (re)installed. The other F-16 also a dual seat aircraft is assigned to the Netherlands Detachment Tucson Arizona (NDTA) which is integrated within the 148th FS / 162nd FW from the Arizona ANG based at Tucson International Airport. Below is a photo gallery of each RNLAF F-16 which has been withdrawn from service since 2018 when the first F-16AM of the 68 strong fleet made his last flight. Presentation is done on serial order. The information will also contain the squadron the F-16 was assigned to, location and date of the photograph and additional info. J-196 F-16AM assigned to 313 squadron. Photographed during Frisian Flag 2018. J-635 F-16AM assigned to 313 squadron. Last chance prior to a training mission. J-866 F-16AM assigned to 312 Squadron. Returning from the NATO BAP rotation.